Sometimes, people end up with more debt than they could hope to pay back with their existing income or salary. Rather than trapping people into a life of debt payment and financial struggle, the law offers an escape hatch, in the form of bankruptcy. Although bankruptcy can give you a fresh start or help you press “reset” on your financial history, it’s not without its consequences. Here’s what you need to know about bankruptcy before deciding if it’s the best option for you. Although the common assumption is that bankruptcy is a process that wipes away all of your debts, it’s a bit more complicated than that. When a person (or business or city) files for bankruptcy, the court intervenes. Any company or person you owe money to is no longer able to sue you. Instead, you, your creditors and the court work together to figure out a payment plan that works, based on your income or the value of your assets. The exact structure a bankruptcy takes depends on the type, or chapter, of bankruptcy you file. In the US, the Bankruptcy Code outlines the different types of bankruptcies available and who they are open to. Each category is named after the chapter of the code it appears in, such as Chapter 7 or Chapter 13. Some types of bankruptcies, such as Chapter 9 and Chapter 11, aren’t designed for use by individuals. Chapter 9 bankruptcy is meant for municipalities, and Chapter 11 is meant for partnerships or corporations. The two types of bankruptcies that are most commonly filed by individuals are Chapter 7 and Chapter 13. Chapter 7 bankruptcy is by far the most common type of bankruptcy. In the fiscal year ending June 30, 2017, there were 489,011 Chapter 7 bankruptcies filed. Both individuals and businesses are eligible to file for Chapter 7 bankruptcy. It’s sometimes called a “liquidation” bankruptcy, as it usually involves the selling of eligible assets to pay off the remaining debt. Some assets are exempt from liquidation. For example, if you were to file for Chapter 7, the court wouldn’t make you sell your home to pay off the rest of your debts. It is possible to complete a Chapter 7 bankruptcy and have your debts discharged without making any additional payments. If you don’t have any assets to liquidate or only have assets that are exempt from liquidation, you won’t have to repay any debt. While Chapter 7 is the most frequently filed type of bankruptcy, it’s not available to everyone. To qualify, you have to pass a means test. Knowing how to figure out take home pay after taxes can help you see if you would pass the means test for Chapter 7. The means test takes the difference between your monthly income and your monthly obligations or expenses. The difference is your disposable income, or what you could use to pay down your debts. The more disposable income you have, the less likely it is that you’ll be eligible for Chapter 7. Only people who earn more than the median income in their state need to take the means test. If you earn less than the median, you automatically qualify. In the fiscal year that ended June 30, 2017, nearly 300,000 people filed for Chapter 13 bankruptcies, making it the second most common bankruptcy filing in the US. Chapter 13 differs from Chapter 7 in several ways. For one thing, it doesn’t involve the liquidation or sale of your assets. Instead, you and the court create a payment plan, which allows you to repay some or all of your debts over the course of three to five years. To calculate your monthly loan payment under a Chapter 13 payment plan, you need to look at your income compared to what you owe. Your total unsecured debt needs to be less than $394,725, and your secured debts need to be less than $1,184,200 to qualify for a Chapter 13 repayment plan. Once the three or five years are up, and you’ve successfully made the payments as outlined in your approved payment plans, any remaining eligible debts are discharged. Although filing for bankruptcy can seem like a “get out of (debtor’s) jail free” card, it’s not a decision to make lightly. Usually, people who file for bankruptcy do so because it seems like the best option available from a menu of not-great options. While each person’s exact reason for filing for bankruptcy might be different, usually a few factors contribute to the decision. Large, unexpected expenses. Not everyone has a hefty emergency fund set aside for life’s surprises. In fact, about 44 percent of Americans wouldn’t be able to cover a $400 surprise expense without borrowing money. Surprise expenses that can lead to bankruptcy include large medical bills or massive damage to a home that’s not properly insured. Job loss. When you lose your job, you lose your income, your insurance coverage and your stability. Depending on how quickly you’re able to find new work or not, being unemployed can put a massive strain on your finances. Poor money management skills. Some people spend their way into bankruptcy, waking up one day to realize that the only way to dig themselves out of massive credit card debt is to wave the white flag. Divorce. Divorce can be particularly tough on a person’s finances, especially if one person in a couple depended on the income of the other. The division of assets or having to buy one half of the couple out of a house or mortgage can also wreak havoc on someone’s finances. Business failure. Some people put their possessions and finances on the line to get a business up and running. If that business fails, a person might have no choice but to file for bankruptcy. 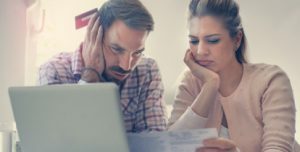 While filing for bankruptcy can be the right choice for some people, others would rather avoid it, because they are concerned about the effect it will have on their credit or about the stigma attached to bankruptcy. Although it’s not always possible to avoid filing bankruptcy, there are a few things you can do to try and avoid it. Make a budget. Knowing how much money is coming in and going out each month can help you figure out what you need to adjust. Find out some of the easiest ways to create a budget that works. Refinance certain loans. In some instances, refinancing a loan, such as your mortgage, can lead to a lower monthly payment, making it easier for you to pay off other debts. Use a mortgage refinance calculator to see if it makes sense for you. Work with your creditors. Some creditors might be willing to work with you to create a payment plan that allows you to pay smaller amounts each month or that lets you defer payments for a set period, then make larger payments down the road. Consider debt consolidation. Consolidating your unsecured debts, such as a bunch of credit card debt into one loan can mean a lower monthly payment and lower interest rate, in exchange for a longer repayment term. Determine if it’s worth it to consolidate personal debt into a new loan with a debt consolidation calculator. Sell some assets. If you have assets that are worth money, you can try selling them, then use the proceeds to make a dent in your debt. Cut back where you can. Finding ways to reduce spending can mean that you have more money to put towards debt payment each month. You don’t have to make permanent cutbacks, but reducing non-essential expenses for a certain amount of time can help you out. Find a way to earn more money. If your budget is already as lean as can be and there’s nothing else to cut out, or if you don’t want to make cuts, another option is to find a way to increase your income. That can range from requesting a raise to taking on a part-time job. You might also pick up side work, such as tutoring or making and selling crafts to earn extra money. Work with a credit counselor. Credit counseling is required both before and after bankruptcy. You don’t need to file bankruptcy to take advantage of the advice and services of a credit counselor, though. Working with one can help you formulate a plan for repayment or help you get your finances on track. If you do decide to file for bankruptcy, the process isn’t so simple as walking into your local courthouse and filling out some forms. Before you’re able to file, you’ll need to complete a credit counseling course, from an approved counseling company or agency. Pre-bankruptcy credit counseling can take place online or over the phone, so you don’t need to schedule a one-on-one meeting with someone. Once you complete the counseling, you’ll receive a certificate to prove it. A few weeks after you’ve completed the paperwork, you’ll be required to attend a creditor’s meeting. During the meeting, the person in charge of your bankruptcy case will confirm that you understand the process and consequences of filing. Your creditors are welcome to attend and might ask you some questions during the meeting. At the end of the meeting, you confirm that you want to move forward with the process. Your creditors can accept or object to the proceedings. If all goes well, the bankruptcy moves forward. You don’t get to file bankruptcy, then sweep it under the rug and act like nothing happened. The process’ effect on your credit history and score can be one of the biggest deterrents to filing bankruptcy. But how much bankruptcy affects your credit depends on a few factors, such as how good your credit was to begin with. If you had a high credit score before you filed bankruptcy, you could expect to see a significant drop in your score afterward. But if your score wasn’t that great to begin with filing for bankruptcy won’t ding it too much. Along with causing your credit score to drop, bankruptcy can harm your credit history. If you file for Chapter 7, that information will stay on your credit report for 10 years. A Chapter 13 bankruptcy stays on your report for seven years. While bankruptcy isn’t a permanent black mark on your record, it can make it difficult to get new credit for up to a decade after your filing. Another thing that’s worth knowing about bankruptcy is that it won’t wipe out every single debt. There are three types of debt that bankruptcy usually doesn’t touch. If you are dealing with the following debts, you’ll want to consider other options. Student loans. Except in the rarest of cases, you can’t file for bankruptcy to discharge your student loans. The only way to get rid of student loans with bankruptcy is to prove that they are causing you an undue hardship. That means that not only can you not pay them now, you don’t think you’ll ever be able to pay them in the future. Tax debts. If you owe the taxman, it is challenging to get a bankruptcy to wipe out those debts. As with student loans, there are several requirements you need to meet before a bankruptcy court agrees to eliminate tax debts. Alimony or child support. Bankruptcy can’t touch past-due child support or alimony payments. Although bankruptcy can have a lasting effect on your credit, the good news is that its results aren’t permanent, as long as you make some changes to your habits and approach to finances to help you avoid bankruptcy in the future. Unless you address the issues that led you to bankruptcy in the first place, filing for it will most likely be a temporary fix rather than a long-lasting one. While admittedly, some causes of bankruptcy are beyond people’s control, others aren’t. If you haven’t yet learned how to keep your spending in check or to live within your means, it’s likely that you’ll fall back into the habits that led to bankruptcy in the first place. Learning to make a budget can help you bounce back after bankruptcy. Your budget will let you see what you bring in each month and how you’re spending it. You can also use a budget to help you reach certain financial goals, such as saving for retirement or a big purchase. You might want to keep working with a credit counselor in the months or even years after you file for bankruptcy — beyond the pre and post-filing counseling that’s required. A credit counselor can help you learn to budget and help you learn techniques and tactics to stick to that budget. Although some of the stigma attached to filing for bankruptcy has faded, it can still be worth your while to seek out a community of others who have been through the same thing. You might find bankruptcy support groups or forums online or a meeting you can attend in your local area. In the first few years after bankruptcy, you might not even want to look at your credit report, but doing so is essential. You’ll want to review your report and check for errors, which can cause additional harm to your score. For example, an account that wasn’t included in the bankruptcy might be marked as “included” or an account that doesn’t belong to you might be listed on the report. If you do see errors, you can report them to the credit bureau and ask that the mistakes be taken off of your report. The good news: you don’t have to wait seven or 10 years to start rebuilding your credit after filing for bankruptcy. It will be difficult to get some loans or types of credit or to get particularly good rates on credit, but you won’t be completely blocked from getting any credit. One of the first steps people often take to re-establish their credit after bankruptcy is to open up a secured credit card. Unlike a typical, unsecured credit card, you need to make a cash deposit to get a secured card. That cash deposit serves as collateral on the card, which is why you can open one without an excellent or even good credit score. A secured credit card might sound like a debit card, but there are a few fundamental differences. For one thing, secured cards typically report to the three credit bureaus, so you can use one to help rebuild your credit. For another thing, secured credit cards typically do charge interest. While you can choose to make the minimum or just above the minimum payments on your card, doing so will mean paying interest on top of the principal. Paying your debt off in full each month will keep you on track for a better credit score and financial future. Depending on your financial goals, it might be possible for you to get a car loan or a mortgage just a few years after filing for bankruptcy. While it might be very tricky to get a favorable rate on a conventional mortgage or a conventional mortgage offer at all with a bankruptcy on your credit report, some mortgage programs will accept applicants with bankruptcies. For example, you might qualify for a Federal Housing Administration (FHA) loan just a year or two after your bankruptcy. If you filed for Chapter 7, you’d typically have to wait two years, and you’ll need to have proof that you’ve re-established good credit during that time. If you filed Chapter 13, you have to wait at least 12 months from the time your case was assigned, have proof that you’re making payments as agreed, and have permission from the bankruptcy court to get a mortgage. While there are plenty of loan programs available to people with damaged or poor credit to help them get back on their feet, there are also plenty of predatory loan programs out there, which seek to take advantage of people who’ve had financial trouble in the past. Payday loan programs can seem like a way to rebuild your credit but often end up trapping you in a cycle of borrowing and repaying money, at high-interest rates. The same is true for many rent-to-own programs, which supposedly help you prepare for homeownership by renting the home first. But if you don’t qualify for a mortgage by the time the lease is up, you might have to pay more to keep living in the property and to avoid giving up the option money you already put down. Having a good idea of where you stand financially, what your monthly loan payments are, and what you bring home after taxes can help you avoid filing for bankruptcy or help you bounce back after bankruptcy. Money Help Center has several calculators that can help you make heads and tails of your money situation. Get your finances on track by checking out our calculators today. You can also subscribe to our newsletter to get the latest money news.